Have you ever wondered why there are so many Contact Forms WordPress Plugins? There are more than ~100 Free Contact forms WordPress plugins available out there in WordPress repository. Providing feedback or submitting questions is an essential requirement for any given blog or site. Well, there are few very nice paid plugins also available out there for pro users. But in this tutorial we will go over only 3 Free WordPress plugins which are very reputed and highly used by WordPress community. Contact Form 7 has been there since more than 5 years and with more than 1 million+ downloads and it’s one of the best plugin in my opinion. By default it comes with simple Contact form which works like a charm. For normal WordPress users, I would suggest you to use this plugin as it comes with lots of customization options and shortcodes. Did I face any problem with this plugin? Well, sometime back in 2015, I was using it and found an issue during form submit action. It was saying message Failed to send your message. Please try later or contact administrator by other way. There was a quick workaround and resolution steps which I mentioned in another tutorial which you may want to look. Another pain point is to install Really Simple Captcha WordPress Plugin if you want to have captcha enabled on your contact form. Why not to have both plugins merged to one rather having it separate? What do you think? If you are pro user and would like to have custom contact form then Fast Secure Contact Form is a plugin for you. You could easily add fields, re-order fields, add multiple TO-CC users, modify CSS styles, Enable Captcha without any plugin, export data, modify all advance part of email settings, etc. I’m currently using this plugin on my other sites and really happy about it. Question: Which Contact Form Plugin Am I using on Crunchify.com? Answer: I’m using Google Form as Contact form. Let’s go over it in details. I love Google Forms a lot. It’s been almost a year we switched over to Google Forms. So far we didn’t face any issue with Google Contact Forms. It comes with lots of options and auto notification with all fields. 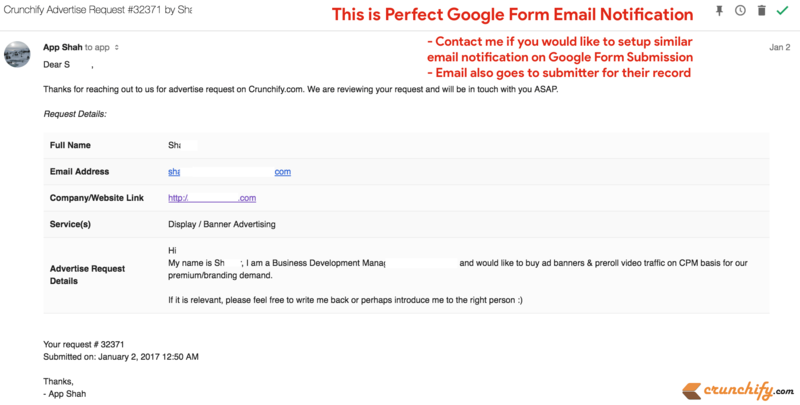 Here is a perfect email notification which we configured on Google Form Submission. Google also stores all details to Google Drive Excel sheet by default. It’s really handy to compile all response list at later stage. Contact Form 7 – How to Fix Error – Failed to Send your Message Correct Way?